Who will win this year’s high-stakes battle of pancake “flip and run”? 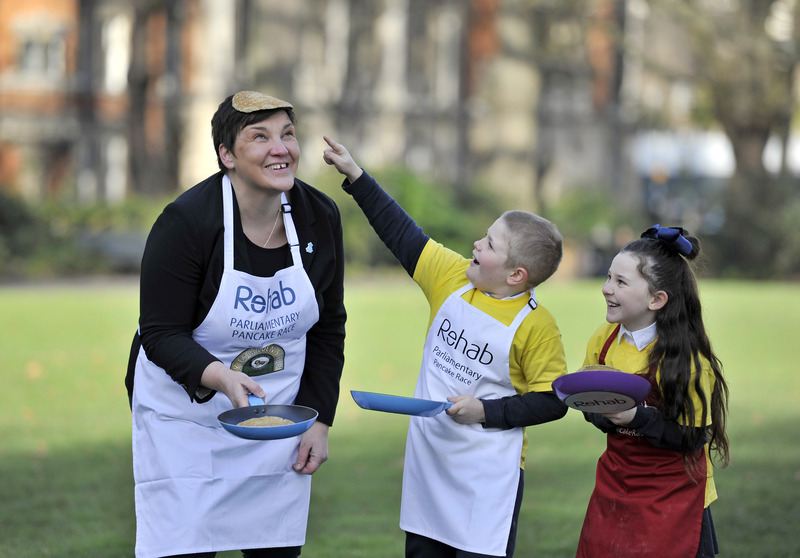 It was a case of no-pancake-spared in Westminster on Tuesday morning as participants from the Parliament and Media Teams faced off for the first time in a pancake-tossing “bootcamp”, ahead of the 21st annual Rehab Parliamentary Pancake Race. The race, which is supported by Lyle’s Golden Syrup, will take place in Victoria Tower Gardens, Westminster, on Shrove Tuesday, February 13 from 10am. With both sides trying to out-psych the other with their fancy flipping manoeuvres, and the Media Team keen to ensure that MPs do not score a hat-trick following their successive victories in 2016 and 2017, the scene is set for a no-holds-barred scramble at this year’s event. This morning’s bootcamp was carefully overseen by race veteran and this year’s Official Starter, ITV newscaster Alastair Stewart OBE. Representing the two teams in this year’s race bootcamp were Tonia Antoniazzi MP representing the Parliament Team and ITV News’ Lucrezia Millarini, representing the Media Team. Alastair Stewart OBE carefully instructed the team representatives on the Race Rules of Engagement which include pans not being used to make unseemly gestures and pancakes not being used as projectiles. Participants also cannot simply just “flip and run” – they must continue to toss the pancakes throughout their lap to a minimum height of three feet. The relay race is one of London’s must-see annual attractions. It draws hundreds of Londoners and tourists who flock to see the runners dress up in pinnies and chefs’ hats to raise awareness of the important work carried out by the Rehab disability charity. Rehab provides training, employment, health and social care services to more than 6,000 disabled people and those at a disadvantage in the labour market. Members of the public wishing to support the work of Rehab’s brain injury services across the UK can visit www.parliamentarypancakerace.co.uk to donate. Have MPs got the “Eggs-Factor”? 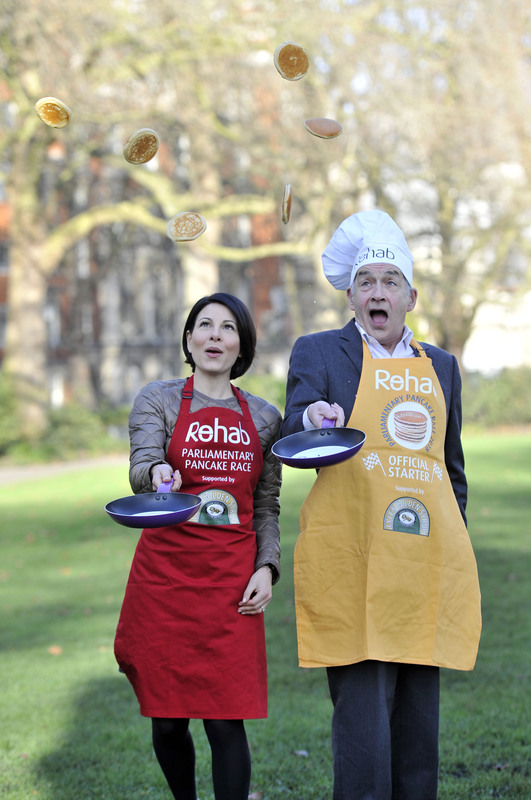 Gerald Mason, Senior Vice President, Tate & Lyle Sugars, has the perfect pancake topping: “We are absolutely delighted to sponsor the Rehab Parliamentary Pancake Race. Lyle’s Golden Syrup, made in the same East London factory since 1883, is one of the nation’s favourite kitchen staples. As the sticky-but-worth-it perfect pancake topping, we are very excited to have the opportunity to join the pancake-flipping fun. It is wonderful to be able to support a charity which has been providing care and support to those living with the effects of acquired brain injury, getting them back on their feet and back to work,” he added.